ANKARA, Turkey (AP) — President Recep Tayyip Erdogan caught Turkey off guard on Wednesday by calling early elections for June, in a move that could cement his grip on power a year ahead of schedule. Erdogan announced that parliamentary and presidential elections, originally scheduled for November 2019 will now be held June 24, meaning that a new political system that will increase the powers of the president will take effect a year early. Erdogan would be able to run for two five-year terms on top of his current term. The move, however, allows the leader — criticized for his authoritarian tendencies — to capitalize on nationalist sentiment that is running high following a successful military campaign to drive out Syrian Kurdish militants from the border enclave of Afrin in northeast Syria and ahead of warnings that the economy could be foundering. It also puts opposition parties, many of which haven’t yet decided who to put forward to challenge Erdogan, at a distinct disadvantage. 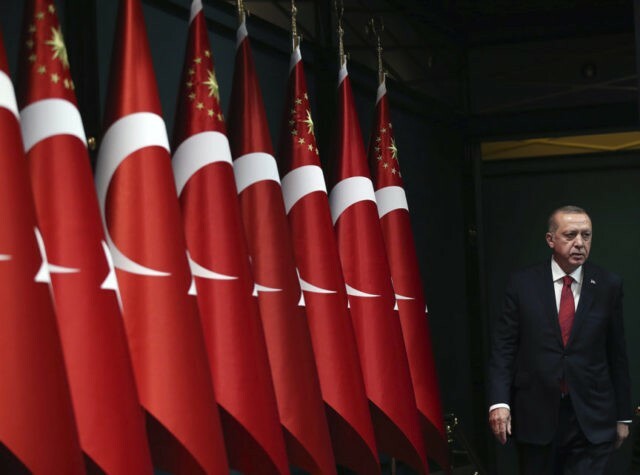 “Erdogan wants to take stock of a number of developments that are in his favor,” said Soner Cagaptay, Turkey researcher at the Washington Institute. “Russia might soon force Turkey to pull out of Afrin,” Cagaptay said. He wants to move forward before the negative news (on Afrin and the economy) start coming in,” Cagaptay said. “Be it the cross-border operations in Syria, or incidents of historic importance centered in Syria and Iraq, they have made it imperative for Turkey to overcome uncertainties quickly,” Erdogan said, in apparent reference to the aspirations for independence by Kurds in both countries. Erdogan announced the early elections after a meeting with Devlet Bahceli, the leader of Turkey’s main nationalist party, MHP, who made a surprise call for early elections citing efforts by unnamed circles to foment chaos in Turkey. The MHP has agreed to an election alliance with Erdogan’s ruling Justice and Development Party, or AKP. Erdogan, who has moved to further tighten his grip on power since a failed coup attempt in 2016, needs a 51-percent majority to be re-elected in the first round of the presidential election. It also follows the sale of Turkey’s largest media group, Dogan Holding, to a group that is close to Erdogan — a move observers say places 90 percent of the nation’s media under Erdogan’s control. Turkey’s weak opposition parties announced they were ready for the polls. They, however, have just two months to prepare for the elections and come up with candidates strong enough to challenge Erdogan. It was unclear whether Meral Aksener, the leader of the fledgling center-right Good Party which broke away from the MHP, would be eligible to run in the polls. Aksener had announced her intention to run against Erdogan and was seen as a strong candidate. Selahattin Demirtas, the charismatic former leader of Turkey’s pro-Kurdish party, is in jail on terrorism charges. It allows the government to close down media outlets and non-governmental organizations. The government argued that security threats from a movement led by U.S.-based cleric Fethullah Gulen, whom Turkey accuses of masterminding the coup, haven’t abated. It also cites Turkey’s continued struggle against Kurdish rebels and other groups. Gulen has denied any ties to the failed coup.